What do the collective works of Mary Shelley, Bram Stoker, Jules Verne, Maurice Leblanc and Sir Arthur Conan Doyle all have in common? All are considered literary masterpieces, all continue to remain in circulation, and all have seen various adaptations across other mediums. Additionally, these works were also first published during the same span of time (19th century into the early 20th century). Aside from these basic observations, they also heavily contribute to the heterogeneous mixture of concepts and ideas presented in Code: Realize ~Bouquet of Rainbows~. When I picked this one up, I wasn’t sure what to expect. I had not seen any coverage or descriptions of this game prior. 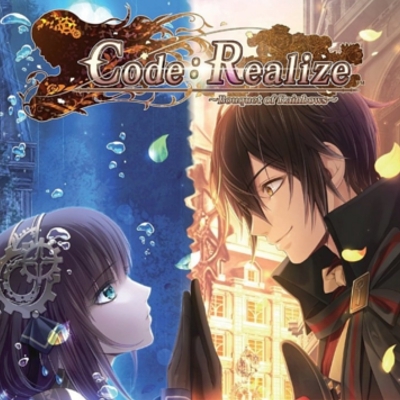 My basic understanding was that it was an otome visual novel split across two smaller titles: Code: Realize ~Guardian of Rebirth~ and Code: Realize ~Future Blessings~. The first of those initially saw a release on the PS Vita back in 2015 (2014 in Japan). That one is comprised of just the main story, having a clear conclusion for each path. The second title was released in March of 2018 (2016 in Japan) and is essentially a collection of side-stories and “where are they now” events. This PS4 compilation that I am taking a look at released in March of 2018 as well. The story in Guardian of Rebirth is structured into a single path of 8 chapters, after which an important decision must be made. Those first 8 chapters are entirely from the perspective of the protagonist and most of the decisions are fairly inconsequential. Towards the end of chapter 9 though, you are given a very important decision: which potential love-interest will you go exploring with to find clues. Depending on your answer to this question, chapters 10-13 will be entirely different. I don’t mean that you will see the same story told from another vantage point, I mean the story will take a complete detour and you will end up with a totally different conclusion for each one. No pressure at all, right? With this in mind, there are only 13 numbered chapters, but given the option of 5 different routes, there are a total of 29 unique chapters. Each chapter is a little over an hour in length and the last 4 focus on the protagonist becoming closer to the person who she chose to go with. So who are these eligible bachelors? You may have heard of some of them already. The first is Arsène Lupin, the world-renowned gentleman thief who pulls off all of his heists in style. He is the self-appointed leader of your party and you are unable to follow his story route until all of the others have been cleared (they saved the best for last?). Next is the genius, albeit childish, engineer, Impey Barbicane. Though his long-term goal is to land on the moon, Impey makes it his short-term goal to flirt with the protagonist. Then there’s the alchemist turned terrorist, Victor Frankenstein. He’s a former researcher from the Royal Alchemical Society and is currently on the run from the British government. Moving right along, your next choice is Abraham Van Helsing. A legendary marksman and hero of the great Vampire War, his past decisions have made him moody and hard to get along with. And finally, there’s the kindhearted aristocrat who puts up with the rest of the party while offering them free room and board. Count Saint-Germain is an eccentric young man who often pays for the expenses of the group and wears a perpetual smile. Not much is known about his past or where his wealth is drawn from. Perhaps just as eclectic as Lupin’s band of “specialists” is the storyline that brings them all together. It’s the late 1800s in an alternate reality Great Britain where King Edward ascended the throne instead of his brother William IV. The UK (specifically its capital city of London) has advanced itself to a level of technology that is unparalleled by the surrounding nations. Renamed Steel London, its various steampunk-inspired technologies were brought to life by a prolific scientist named Isaac Beckford. It’s here where our protagonist, Cardia, looks for answers. Cardia is a young woman who, at the onset of the game, lives isolated in an abandoned mansion outside of Wales. Her memories of who she is and why she is in that mansion only reach back 2 years into the past. To make matters worse, she is regarded as a monster by those in the neighboring village, as her skin is poisonous to the touch and causes things to disintegrate and die. She leaves the mansion not long after the opening events of the game, spending the rest of it looking for answers to her questions about her past, present, and future. In terms of story presentation, each chapter is roughly the same length. I appreciated this because it helped me anticipate how many chapters I’d be able to get through in one sitting. What I didn’t appreciate was the lack of a visual flowchart to help me keep track of my decisions and where I was in the story. From the main menu, you can navigate back to previous chapters that you’ve already completed, but there is no indication of what choices exist within those chapters or which ones were chosen. Having said that, I did appreciate that regardless of which love interest I chose to pursue, the chapters for each were segmented in the same way. I also appreciated that while each bachelor’s story was wildly different, they all had similar threads that linked them together in the end (a “true” ending which I won’t spoil). The story itself is one of the biggest pros and cons of this game (depending on how you look at it). The borrowed concepts from Dracula, Frankenstein, and Sherlock Holmes (to name a few) are meshed together really well. All of them fit perfectly with that turn-of-the-century steampunk vibe that the game is going for. Even though the examples listed above have little to do with one another, they are married quite well and don’t seem overly forced. All literary references aside, one of the things that both drove me crazy and made me happy was the sheer abundance of deus ex machina moments presented throughout the story. Nearly every problematic encounter that the adventuring party must overcome seems impossible. Without fail though, there’s always some sort of miracle that happens or some unrealistic foresight on the part of the characters that “explains” how they are able to get by unscathed. I say that this is both a pro and a con at the same time because none of these moments feel natural or realistic, but I’d be lying if I said that they weren’t entertaining and added to the charm of both the story and its characters. I think it’s very interesting to see Victor Frankenstein exchange banter with Abraham Van Helsing and then arrange for a meeting with Queen Victoria of England. It’s absurdity of the greatest kind. Overall, I’d say that the story was very enjoyable and the characters were developed really well. In terms of artwork and sound design, I was also very impressed. The background music wasn’t overly memorable, but it did fit the mood for each scene appropriately. The voice acting was a sizable step above and the actors did a great job conveying each character’s personality. The art was also quite striking. The backgrounds were very reminiscent of what one might expect of a Thomas Kinkade painting. They were all surprisingly detailed and full of color. Obviously Kinkade never included anime-styled character portraits in his paintings, but the portraits in Code: Realize all fit quite well with the backgrounds. There are more than enough distinct emotions for each character that they didn’t seem stiff or uninteresting. It also wasn’t too noticeable that they were overlaid onto the backgrounds, as the edges seemed to blend right in. The character portrait for Impey’s dog, Sisi, was a bit disappointing though. In porting both titles to PS4, the transparent background for Sisi was not maintained. The result is a completely visible transparency grid that was jarring to look at whenever Sisi was on screen. Some lesser issues that I found include the English translation, the glossary feature, and some of the random changes in perspective. As for the translation, I can’t recall finding any spelling mistakes. There were however some missing words and a number of grammatical errors peppered throughout both titles. At one point, the subtitles for Victor’s dialogue refer to Delacroix II by his name in the Japanese version. These issues are rather unfortunate, but understandable for these types of localizations. The aforementioned glossary feature is one in which the player has the option of pressing a button during a scene to display a brief explanation of words that appear in bold. The basic idea behind this is nice and even allows you to revisit these explanations from the main menu. The execution of the idea isn’t as nice though. Half of the time, the bold words don’t directly correspond to what is actually being described. Additionally, it often felt like every other screen had one of these glossary items pop up. This felt a bit excessive and initially took me out of the experience. In that same vein, the changes in perspective were also bittersweet. Near the end chapters especially, there will be random jumps from the protagonist’s inner thoughts to those of another character. This was a nice change of pace since 90% of this inner monologue is from her perspective, but these switches were never announced or explained. Context clues will be your only guide to understand these switches. All three of these “pain points” are relatively minor, but they do deserve consideration nonetheless. In contrast with the first title, Future Blessings is segmented into 5 short follow-up chapters for each love interest, each just over an hour in length. There are also 3 side stories that span about 3 to 4 hours each. These side stories were by far my favorite parts. All of them take place either right before or right after chapter 9 and take the story in some really new directions. One has you getting caught up in some violent problems within the London Mafia. Another shows you an alternate retelling of chapters 10-13 from Finis’ perspective. Yet another let’s you follow along with the adventures of Lupin’s arch-rival, Herlock Sholmès. This extra content was by no means needed given the satisfying endings of the first title. Having said that, it is more than appreciated and feels right at home with the original content. It may not be as long as the first title, but it feels like a natural extension of it. At the end of the day, my playthrough of Guardian of Rebirth clocked in at right around 39 hours. Future Blessings was shorter and disjointed, but it still took me about 16-17 hours to complete. In total, the Banquet of Rainbows compilation took me somewhere in the ballpark of 55-56 hours to complete. Despite some issues with the translation and the lack of a viewable flowchart, I was quite pleased with my time investment. Interestingly, there was an anime adaptation of the first title released in late 2017 and there is a follow-up game planned for localization sometime in 2019. If it’s any indication of my feelings towards the story, I plan to give both of those a look too. Code: Realize ~Banquet of Rainbows~ is available exclusively for PS4 (in North America) at an MSRP of $49.99 USD. There are also the Vita versions of Guardian of Rebirth and Future Blessings. A Switch version was recently released in Japan, so a North American release of that is also likely at some point. Given the abundance of content and its overall quality, I’d say this one’s definitely worth your time.